When you think of great food destinations in Asia, what cities come to mind? Bangkok? Hong Kong? Maybe Tokyo? What about Georgetown, Malaysia? Sitting on the island of Penang off the northwestern coast of Malaysia, Georgetown is a former British colony that is becoming one of the hottest culinary destinations in the world. When I visited the island recently, I made it my goal to learn more about the region’s food. After sampling some of the city’s most delightful dishes in various restaurants and street stalls, I made my way to the Tropical Spice Garden to learn how to make some of the city’s specialties. Starting with a tour of their spice garden, I was introduced to many of the spices and flavors that I would soon be cooking with. After the tour, which lasted about an hour, my group and I were led to the cooking school area. The cooking school was very modern and featured space for up to 10 students. The ingredients that we needed were already laid out for us, and the onions were even peeled. Our menu was called “A Complete Malaysian Lunch” and was led by our cooking instructor, Azizah. 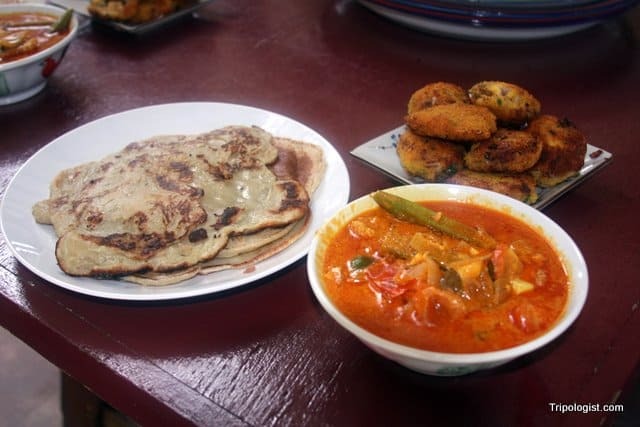 On the menu was chicken cutlet with potatoes (called begedil in Malay), fish curry, and banana pancakes. 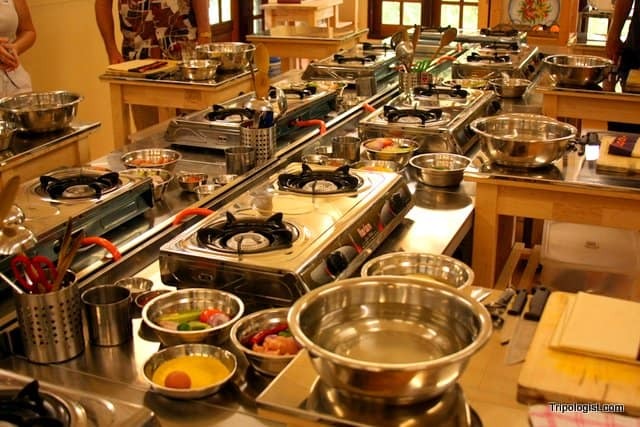 The modern facilities at the Tropical Spice Garden Cooking School. After donning our Spice Garden aprons, we started by mixing the batter for our banana pancakes. After the batter was mixed, we moved on to the chicken cutlets with potatoes. First, we had to brown the pre-cut potatoes and dice the vegetables. We then cooked the chicken, cut it into pieces, and mixed everything together. Finally, we made small meatballs from the mixture and, after dipping them in breadcrumbs, cooked them until the outside was a golden brown. Then, we moved on to the fish curry. We all had portions of fish in our bowls, and I was lucky (I guess that’s the right word) to have a portion of fish roe in my bowl. We started the curry by cutting up the vegetables and then browning half of them in a clay pot before adding water, curry powder, and other spices. We then added okra, the fish, and coconut milk to the mixture. Finally, we were ready to cook our banana pancakes. Since we had already made the mixture, this was a simple as putting a bit of the mixture in a pan and cooking it until it was golden brown. At last, it was time to eat. The seven of us in the cooking class all loaded our food onto trays and carried them up to the eating pavilion above the cooking school. While there, we finally got to taste the efforts of our morning labors. In one word, the food was fantastic. I don’t think that I’ve ever cooked food that delicious. The chicken cutlets were perfectly seasoned and moist, the fish curry was just the right amount of spicy, sweet, and sour, and the banana pancakes were warm and delicious. Before we left, we were each given a copy of the recipes so that we could make the dishes at home. Fortunately, there was very little that we used that would be hard to come by in a western country. 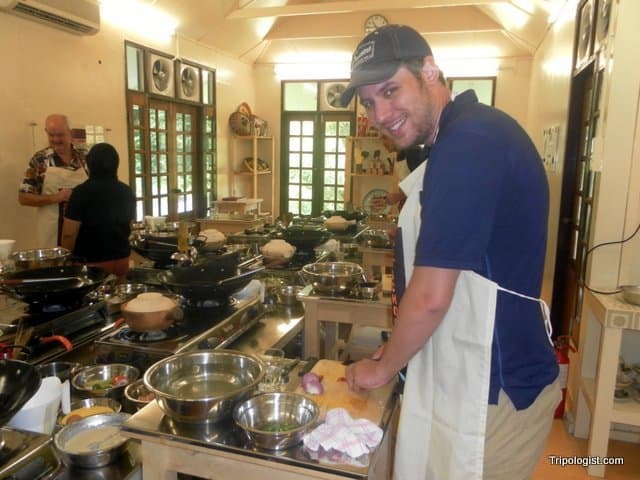 Learning to cook at the Tropical Spice Garden in Penang, Malaysia. I’m very glad that I had the opportunity to visit the Tropical Spice Garden Cooking School and would highly recommend it to those interested in the region’s food. Emphasizing the island’s many influences, they offer a different menu and food style Tuesday to Sunday, featuring Malay, Nyonya, and Indian cooking. You can reserve your spot by visiting their website. Overall, I would have to say that my trip to one of the world’s culinary capitals was a success. I not only got to try some fantastic food, but I got to learn how to make some of it as well. Getting to the Tropical Spice Gardens is fairly easy from downtown Georgetown. You can hop on bus 101 or 102, both of which stop at the central bus station at Komtar. You can also pick up bus 101 from Lebuh Chulia Street in the center of Chinatown. It takes about 45 minutes to get to the Spice Gardens from Chinatown on bus 101. I love food in Penang! I’ve been there twice already and enjoyed their food streets, everything is so delicious in Penang, thanks for this article, might try this cooking school next time I’m there! That sounds like a very cool experience. 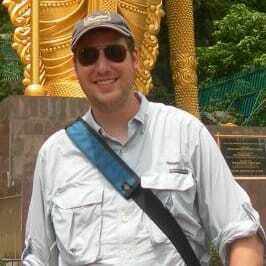 I’ve taken cooking courses in Chiang Mai, Battambang and Saigon in SE Asia but never Penang. I agree with you about it being Malaysia’s food capital, but I also think it shares this distinction with Melaka. I often had a routine of eating dim sum for breakfast, Indian curry for lunch and hawker style Malaysian food for dinner. Melaka is another great place to get some food. Thanks for the comment.